Well, it’s getting really warm out, with Summer officially here, and I must say there is no better way to get warm and cozy (or to cool off a bit from a long day at work) than taking a nice long soaking in a comfy bathtub! 😉 So are you a bath junkie, looking for a new beautiful tub to soak in? 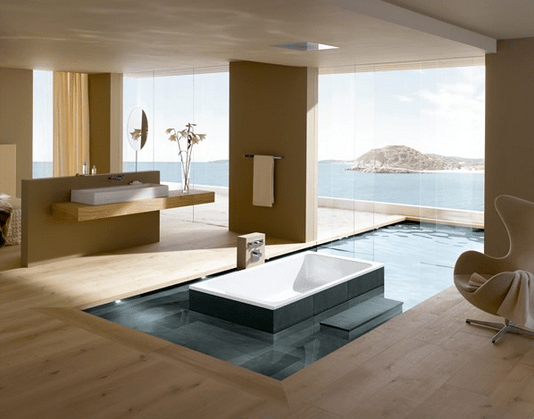 It is easy to dive into the endless possibilities of bathtub looks, styles and finishes, and lose track of such important considerations as cost, comfort, quality, and fit. 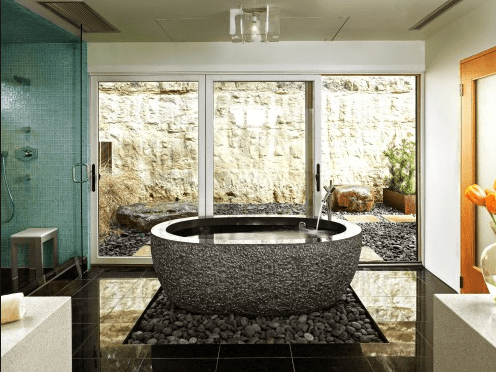 Between your budget, personal needs, space limitations, materials and aesthetic design preferences, this guide will help you zero-in on your dream bathtub. If you are replacing an old tub, or installing one into an existing bathroom space, than you may face certain limitations as to the type of tub you may be able to install. 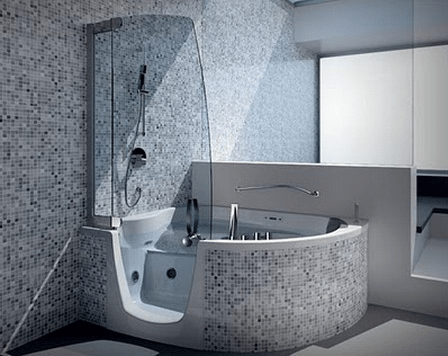 Your existing tub, especially if it was a built-in one, walled from three-sides, may only allow you to install the same size/type of tub, only a different material. Similarly, the size of your bathroom and its other fixtures such as a shower, toilets, sink and cabinetry may limit the location and size of your new tub. You can significantly increase your bathtub options, if you are willing to spend more money on major modifications to your electric wiring, plumbing, possibly rearrange/move other fixtures or do a gut renovation. When shopping for a new bathtub, don’t forget to allocate the budget for installation, as it can often cost more than the tub itself! Typically, installation can cost as much as $2,500 to $3,000. The bill will be even higher, if any special plumbing work needs to be done, such as relocating plumbing features. As a result, if you don’t want to end up spending a fortune on a new tub install, make sure you research which type and size of tub would work best with your existing bathroom size and design. 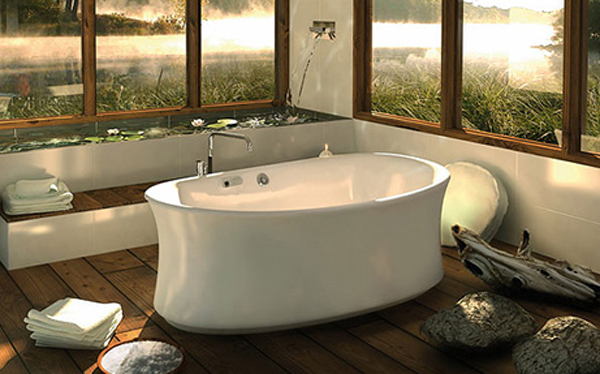 Conventional bathtubs can either be built-in or freestanding. Built-in models are more common, and can be walled on three sides (most homes have this set-up), tucked into a corner, or dropped into a frame. A dropped-in tub can be on a platform or it can be set below the floor level. Freestanding models can be very dramatic and can become the focal point of the bathroom, such as an old-fashioned claw-foot tub, or a modern tub, that rests on a platform in the middle of a huge bathroom space. Also, many freestanding models will have more slope to the back than build-in ones, making it more comfortable to lay down and soak. The cost for conventional tubs varies greatly, from $200-300 to $6000 and up (plus installation). The price is often determined by the quality of the material, as the cheapest models are usually made from plastic, while expensive tubs are typically made from natural stone or metal. Also known as Japanese, Asian or Greek, a soaking tub is an ideal option, if you like to be deeply immersed in water. These tubs are typically 26-34 inches deep, compared to only 14-16 inches of conventional tub depth. However, the disadvantage is that you will not be able to lay down, as they are short, measuring only 4 ft in length, as opposed to 5 ft, standard to conventional tubs. 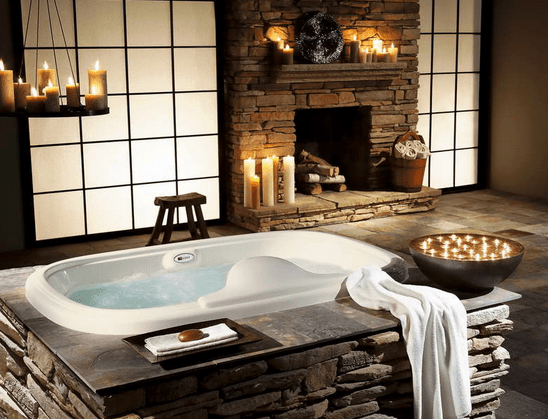 Round soaking tubs are gaining in popularity, and these measure about 40 inches in diameter. Soaking tubs are usually free-standing and can be made of stone, wood, metal or acrylic materials. This tub may cost anywhere from $1,500 – $6,000 (plus installation), but there are also many custom made soaking tubs, which would cost even more. As attractive as the idea of a soaking tub may be, it is very important to actually try sitting one before you spend your money, as some people actually do not find them very comfortable. Do you have sore muscles or would love a message after a long day of work? Then a whirlpool tub may be a dream come true. These tubs can either be free-standing or built-in, and come in a wide range of sizes, shapes and materials. Water jets, air jets or both are used to agitate the water, and each one has its advantages. Water jets are a more common feature and are known for providing a more vigorous massage. One downside is that water may remain inside the jets after you are done, increasing the possibility of mold and bacteria growth, which can cause respiratory problems. To avoid this, make sure that you regularly flush the jets, once every week. Air gets are gentler, but also more noisy, and may lose heat quicker than water jets. Having both types will give a more varied massage, but they also cost more and require two electric hook-ups. 1. You may require a separate water heater. Many tubs require as much as 40-50 gallons of warm water to operate and are programmed to shut down if there is not enough water. 2. You may need to reinforce your bathroom floor to properly support the tub. 3. You will need at least one dedicated electric outlet and heavy duty electric wiring (between 15-20 amps). 4. You will need to determine the location of the pump that will power the jets. If you or a family member have limited mobility, than stepping over the side of a conventional tub may prove to be a major challenge. To avoid unnecessary pain or the risk of injury, you can install a walk-in tub, which is typically 4 inches shorter than a conventional one. Walk-in tubs come in a wide range of shapes, sizes and materials. For the best quality and longevity, look for ones that are made with a steel frame covered by acrylic or fiberglass. Other common features include: handrails, a slip resistant bottom and a built-in seat. Basic models cost about $1,000 (plus the cost of installation), while high-end, spa-like models can cost as much as $10,000. One disadvantage of these walk-in tubs is that you first have to walk-in and close the watertight door, before you can fill it up with water. Similarly, you have to let it drain completely, before you can get out. Sometimes buying a new bathtub is not financially feasible, but it does not mean you have to be stuck with a dingy looking tub. Instead, you can give your old bathtub a facelift, and it will look and feel as good as new, at only a fraction of the cost. If your present bathtub is made either from iron, enamel coated steel or fiberglass, you can have it professionally refinished for an average price of $300 – $500. The refinishing job will take one day and you can take a bath that night! If you have an acrylic tub, you can have a new acrylic liner installed over it, for about $1,000. Installing a liner is a bit more involved than refinishing and takes longer. First a home improvement professional needs to measure and photograph your tub. Then, they send out the order to the liner manufacturer, and it may take 4-6 weeks for the product to arrive. Installation should not take more than a day, but you should be aware that in some cases additional plumbing work may be required to extend the drain, which can add a few hundred dollars to your project.